I had clear skies again this evening. The only potentially interesting pass though was that of USA 129 at 20:23 UTC. I did see it visually, with the naked eye, as it crossed the Big Dipper: it was very faint though. Magnitude +4 I guess. There is a hint of a trail on the photograph, but nothing measurable alas. Bjorn Gimle recovered the keyhole satellite USA 129 (96-072A, #24680) on the 23rd when it came out of its winter dark period. Following this, it was observed by Lutz Schindler, Alberto Rango and yesterday evening finally by me. I obtained two points with one very lucky picture. It was obtained amidst flying cloud cover: the one moment the sky was clear, 2 minutes later covered, then clear again etc..... The Big Dipper cleared only a minute before USA 129 would cross it! A minute after the passage it was clouded over again...! Only part of the resulting photographic image was not clouded, but that part yielded well enough stars for a good astrometric solution (I measured 100 stars). So, a lucky shot! These two points are almost exactly on time (both delta T -0.06s) with regard to Mike's elset 06085.80344161. The cross-track devation is however 0.17 resp 0.19 degrees (a factor 10 larger than usual, usual is 0.01 to 0.03). I believe this is a real deviation value, not a measurement inaccuracy. The trail on the image was not very bright, but crisp. So clearly, the updated orbit still needs some fine tuning. Today around noon, there was a partial solar eclipse visible from my country. Much of the country had cloud cover and we started cloudy here too, but around the eclipse we got clear skies here in the coastal area. Inbetween several appointmeents I managed to snap a few pictures. Below is a compilation. Conditions were poor this evening: haze due to very thin high altitude clouds lowered the limiting magnitude considerably. Still, some work could be done. And I was rewarded for the effort with observing and imaging a nice short-duration magnitude 0 flare by Lacrosse 4 (2000-047A, #26473). 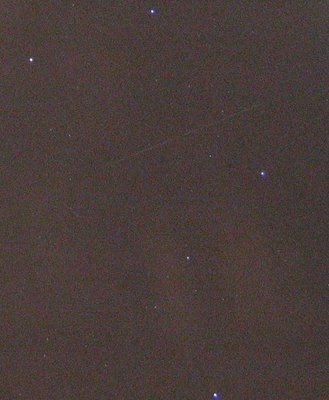 The image above shows the flare: the start of the trail coincides within a second or so with peak brightness, and the satellite then can be seen fading rapidly. Stars visible are in Leo. Only the bright start of the trail was measurable and hence yielded one point. It is 0.3 seconds early with regard to Mike's 9 day old elset 06072.38962997. It corresponds quite well in delta T to the series of positions on 2000-047A obtained by Scott Campbell 20 hours earlier (delta T also -0.3 sec). Both Scott and mine are however a few tenths of a second different in delta T from a position reported by Russell Eberst, while a position Lutz Schindler reported only minutes after my observation is different by as much as 2 seconds in delta T. Which shows the human factor in this work. That became evident in another way this evening too. I tried to observe Lacrosse 5 during its 19:30 UTC pass and failed to see it. This while Philip Masding from the UK and Lutz Schindler from Germany did see it only minutes before and after my attempt! Maybe it were the observing conditions, although I really would have expected to see Lacrosse 5 at its usual brightness of mag. +2, the more since I was able to see Lacrosse 4 at a similar brightness (before it flared) 20 minutes later. Update: Pierre Neirinck from France reports he initially couldn't see it either on that pass, eventually picking it up rather late at 19:33 UTC. So he believes Lacrosse 5 did its "disapparance trick" again between the observations of Philip and Lutz. After a few grey days, this monday turned into a very clear day. Bright blue skies in the daytime, good dark sky in th evning. I had only one good pass this evening, but a nice one: Lacrosse 5 (2005- 016A, #28646), one of my regular targets lately, made a near-zenith pass at 19:38 UTC. Lacrosse 5 was bright and steady, appearing in the west-northwest, crossing over Cassiopeia and climbing towards the zenith and Ursa Major, at magnitude +2.0 to +1.5. No "disappearance tricks" this time. The last two (marked by an asterisk) deviate from the rest of the set by some 0.2 seconds in delta T. This means I might have been a tad slow in pressing the shutter release button for the last image. Got a nice bunch of data on Lacrosse 5 (2005-016A, #28646) last evening. I observed two passes (19:08 and 20:50 UTC) , under poor conditions (moonlight, veil of very thin high altitude clouds with more solid patches in it). Nevertheless obtained some good trails: 3 out of 4 photographs yielded useful points (6 points reported in total, 5 of which are consistent). Observations on March 11 & 12 had suggested to me that Lacrosse 5's "disappearance trick" might occur when it reached 64-65% illumination. If that would be correct it should do the trick again at about 19:09:30 UTC. In fact, it did at 19:09:41 +/- 3 s UTC, the satellite having reached 65% illumination at 19:09:39 UTC. This is very intrestinng: what is happening at 65% illumination thatt could cause this behavour? At the next pass, I observed it being bright (+1.5, brighter than the previous pass when it was +2.0 to +2.5), at illuminatons between 68% and 70%. So wat ver happens it to 'dsappear"at 65% illumination, the effect is gone again by 68% illumination. An attempt to also capture Lacrosse 2 failed as a thick patch of clouds occupied the part of the sky where it would pass. Lacrosse 5 disappearance trick & timing problem gone? I observed Lacrosse 5 doing its disappearance trick this evening. I think this explains my non-observation of March 6th in combination with Peter Wakelin seeing it easily only minutes before. 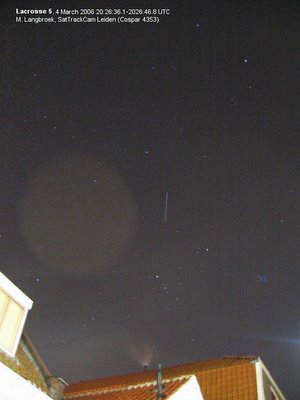 Saw it making a nice pass here around 19:11-19:15 UTC (obtained two good trail photographs during this pass), easily visible at mag. +1.5 to +1.0 or so. Just after the last of my two exposures ended (19:14:51 UTC), and well before it should get into eclipse, it suddenly disappeared from naked eye view, within maybe 3-5 seconds so very fast. 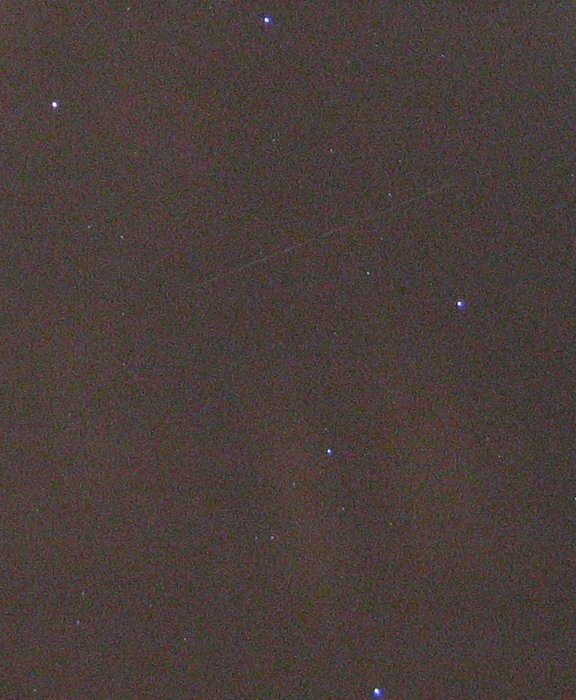 This was at about 19:15:00-19:15:10 UTC or so. I think this might happened at March 6th as well, just before I started to look for it. I obtained two pictures during this pass, hence 4 points. 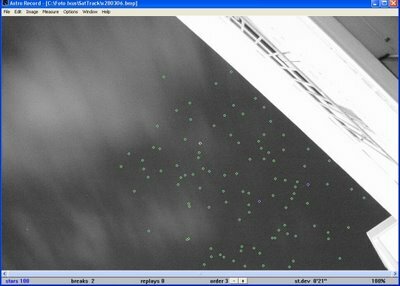 One point (point two of photograph 1) was clearly anomalous (delta T +0.35), the other three are very consistent both internally and with Mike Mccant's latest elset for Lacrosse 5. The -0.3s delta T deviation of the previous week (see the previous post) has gone, even though I did not make an extra time correction! Pierre Neirinck noted that Lutz Schindler, who also used the DCF77 time signals, had a similar time deviation last week. So I am now starting to believe that the problem was not with the camera at all: but with the Frankfurt time signals! I just did a new GPS measurement on the courtyard. Got a good fix, and it yields the same coordinates with differences only in the second decimal of the arcseconds. So no problem there it seems. Also checked the DCF77 radio-controled clock I use. It seems to be okay when I check it against my computer clock, which is synchronized each 5 minutes by an NSTP server. I realized I *did* alter my camera settings shortly in December, while taking night-time images of snow in Delft. But I changed them back to the old settings again afterwards, as far as I am aware of. Again: oh, how I love Japanese electronics... From now on I'll refrain from doing anything to the manual settings again. Well, I guess I have to work with another empirical 0.3 seconds correction again from now on. By making such a correction to the datasets I reported the past two weeks, my data come quite in line with the other data again. A no-show of Lacrosse 5, and timings off again? Quicksat predicted two good near-zenith passes this evening, of both the Lacrosse 5 Rocket stage (2005-016B, #28647) and the payload itself, Lacrosse 5 (2005-016A, #28646). The payload, Lacrosse 5 itself, made a no-show an hour later. Predicted to be mag. +2.1 it should have been easily visible: but I failed to see it with the naked eye and there is no trace of it on the obtained image too. This image was obtained by me this evening and shows Lacrosse 5 (2005-016A, #28646) while flaring. Here, it goes from about mag. +1.0 to +0.5. It reached peak brightness of about mag. 0 some 5 seconds after the end of this exposure, short before shadow entry. The trail is well defined, so no trouble measuring it. A good set of data, no doubt. Useful data, as it seems Lacrosse 5 has just manouvred (see posts by Scott Campbell and Ted Molczan on the SeeSat-list here and here) and its brightness behaviour is odd the past few days (see messages here and here). We are having snow here. Yesterday I had some hopes as there were some sharp clearings inbetween the snowstorms: but alas, not during the relevant passes.